Children are especially prone to illness in the winter months, and sore throats are one of the most common reasons for a wintertime visit to the doctor. Sore throat, known technically as pharyngitis, is a side effect of a great many ailments, including the common cold and the flu. While rarely dangerous, a sore throat can be painful for your child and appropriate steps to diagnose the cause and prescribe treatment should be taken. Leading an overall healthy lifestyle is the best way to keep the immune system strong and the body healthy enough to fight off germs. Eating nutritious foods and getting enough exercise can help your child keep in good overall health. Good hygiene practices such as frequent hand washing can also help, and whenever possible, try to keep your child away from others who are sick. Cold and flu viruses are contagious and can be caught easily. In the same vein, not sharing food and drink can prevent the transfer of germs. There are generally two types of sore throat: viral and bacterial. Bacterial sore throat is what is known as “strep,” caused by the streptococcus bacteria. Strep is widespread among young children, but is fortunately easy enough to diagnose and treat. A quick throat swab and analysis performed right in the Pediatric ENT office can let your physician know if your child has strep throat, and if the results are positive, antibiotics can be prescribed. Viral sore throat is often the result of a cold, flu, or other virus, and unfortunately often needs to be waited out. In the meantime, medication to help alleviate symptoms can be taken, and your child should rest as much as possible to speed up recovery. Your child’s physician will diagnose which type of virus is causing the sore throat and prescribe appropriate medication. If your child suffers from chronic sore throats, there is a good chance that their tonsils are prone to infection and should be taken out. Tonsillectomy, or the removal of the tonsils, is a quick and safe procedure which can help children with frequent pharyngitis. The surgeons of Pediatric ENT Associates have years of expertise in performing tonsillectomy surgery, and will take good care of your child before, during, and after the procedure. If your child is suffering from a sore throat, don’t hesitate to call Pediatric ENT Associates for your child sore throat treatment. 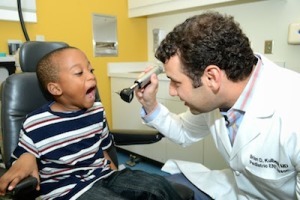 To learn more and to schedule your child’s appointment, just call 205.315.5633!